John Milton left the party via the door nearest the spot the beautiful woman in the red dress had occupied before she vanished. He didn’t believe in ghosts. If he wasn't hallucinating from fatigue, this was probably the handiwork of some joker in Network Control peeved that his new electronic toy wasn't in last week's shipment from Adagio. Joker or not, the man knew his business. John had seen holograms before, but never one so perfect, so lifelike as this one. He turned a corner, muttering to himself, and was nearly to the end of the dimly-lit corridor before he realized it was a cul-de-sac. He whirled about to retrace his steps, and pulled up short. She was there. Close enough to touch. The woman tilted her head, an amused smile playing across her lips. "Hello again, John. I'm so glad you decided to pursue me. I was hoping we might talk awhile, in private." "Someone with an interest in this colony...and in you." "If this is somebody's idea of a prank, I'm not finding it at all amusing." "It isn't a prank. I simply want to ask you a question. A serious question." He folded his arms across his chest. "I'm listening." 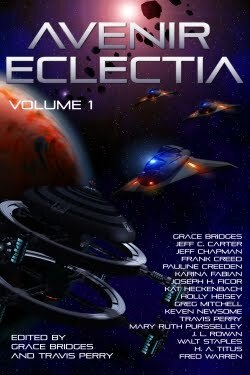 "Who controls Avenir Eclectia? Where does the true power reside?" This was the question? A half-educated child could answer it. "The Peace Council, of course. They govern the colony, enforce law via the Peacekeepers, adjudicate disputes, regulate trade..."
She frowned. "Come now, you have more insight than that. Let me put it another way. Why are you living in luxury on Avenir rather than scrabbling after insect carcasses in the ash, on Eclectia?" "Trade. I broker the exchange of raw materials from Eclectia for processed goods from Avenir's nanofactories, and I’m very good at what I do." "It seems terribly inefficient. Why aren't there any nanofactories closer to the source of the raw materials?" His irritation was mounting. He'd had this conversation a million times with all manner of politicians, petty bureaucrats, and spacers. "Well, the factories require a zero-gee environment for maximum throughput, but I suppose the real reason is that we can't replicate them. The technology is held by the First Families...but they're all Dreamers." Her words were like an icy rivulet of water down his spine. John edged backward, away from the woman, until he bumped into the featureless metal wall at the end of the corridor. If the stories were true, there was a person directing this image, but its true form was a bloated, deformed travesty of humanity, or a disembodied brain, or an amorphous thing floating in a nutrient vat, somewhere in a dark, armored recess of the station. "You’re lying. The Dreamers are wired into a virtual fantasy world. They’ve abandoned all human contact." She smiled and slowly closed the distance between them as John flattened himself against the wall and turned his face away. "Oh, not all human contact. It's a useful bit of propaganda, and not entirely false, though we're much more intimately involved in the affairs of this colony than anyone, including the Peace Council, could imagine." The image flickered as she bent forward to whisper into his ear, and he squeezed his eyes shut as his hands clawed against unyielding metal. "We represent an unbroken line from the original command crew of the Avenir, and we still take our responsibilities very seriously. One of those responsibilities is stewardship of the nanofactories. They are the true heart of Avenir Eclectia. Without them, the colony dies. No machines, no weapons, no replacement parts, no medicine. The hunters can't hunt, the miners can't mine, the undersea cities and the station fall into disrepair, and plague ravages the population." He could feel her breath, warm and feathery on his cheek, and a wisp of spicy perfume hung in the air. No. That's impossible. He forced himself to open his eyes. She stood five feet away now, her blue eyes drilling into him. Measuring him. He swallowed hard and forced out the words: "What do you want with me?" "We've been watching you for some time, John Milton. You are intelligent, energetic, and ambitious. Most of all, you are one of only a few people on this station who understand that our colony is doomed unless the status quo is changed. You have a vision for its future, a vision that we, with slight variations, share." She blinked out of existence for a moment, then reappeared at the corridor intersection. The calculating expression was gone. Her eyes were moist. Pleading. I'm dying, John, and I have no heir. I'm inviting you to take my place. Join us. Become a Dreamer. Oooh. Very interesting development. I'm so glad to finally get more of this story! It was very well-written, and the plot is fascinating. This opens up a whole lot. And it draws one in. "That was no lady, that was my...?"